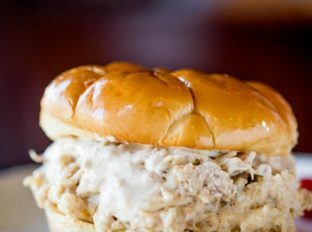 Slow Cooker Chicken Caesar Sandwiches made with easy homemade caesar dressing, Parmesan Cheese and a buttery kaiser roll. 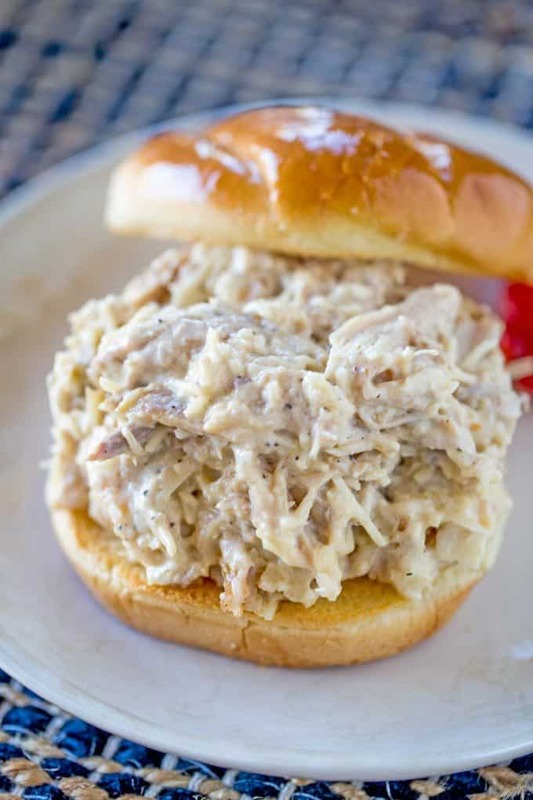 Slow Cooker Chicken Caesar Sandwiches are another in the ever growing list of slow cooker sandwiches that are on the site. I know it seems like we’ve been barreling through these sort of quickly, but I have to say they are changing the way we eat here at home. I’ve been in charge of lunch prep for my husband since we started dating over 10 years ago and I have always hated either having to be creative or having to resort to deli meat. 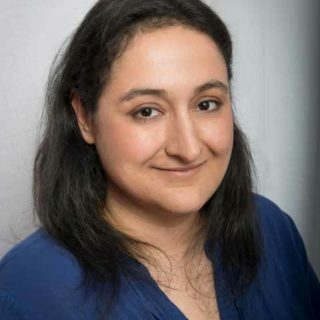 Then when I was pregnant for the first time I learned about something called nitrates and nitrites. ? So, after reading some horrible accompanying material about how they can be bad I started buying nitrate/nitrite free deli meats. But that still didn’t make lunches any more exciting. Since jumping on the slow cooker sandwich train my husband (I don’t need to pack lunches for myself ?) has been infinitely happier. 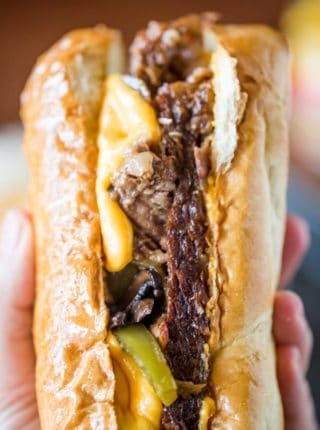 I’ve got 8 or 10 lists of the best sandwiches ever and I am working on as many as I possibly can through slow cookers. I’ve had a couple of hiccups along the way. A banh mi and a cuban version that didn’t make the cut (still working towards those), but aside from those we’ve all been thrilled with the new sandwiches. 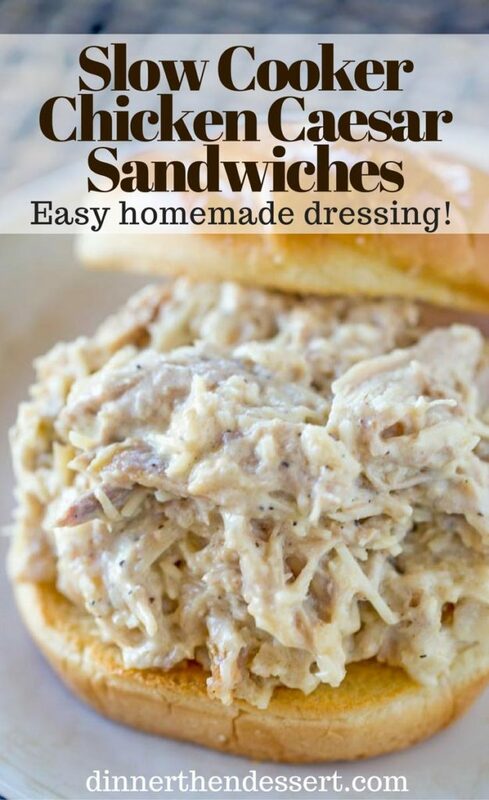 These Slow Cooker Chicken Caesar Sandwiches are among the easiest on the list, but they’re so incredibly delicious. Since the filling is all mixed you can even pack it separately from your bread to avoid soggy bread. Simply mix together the ingredients and let sit for about 15 minutes. 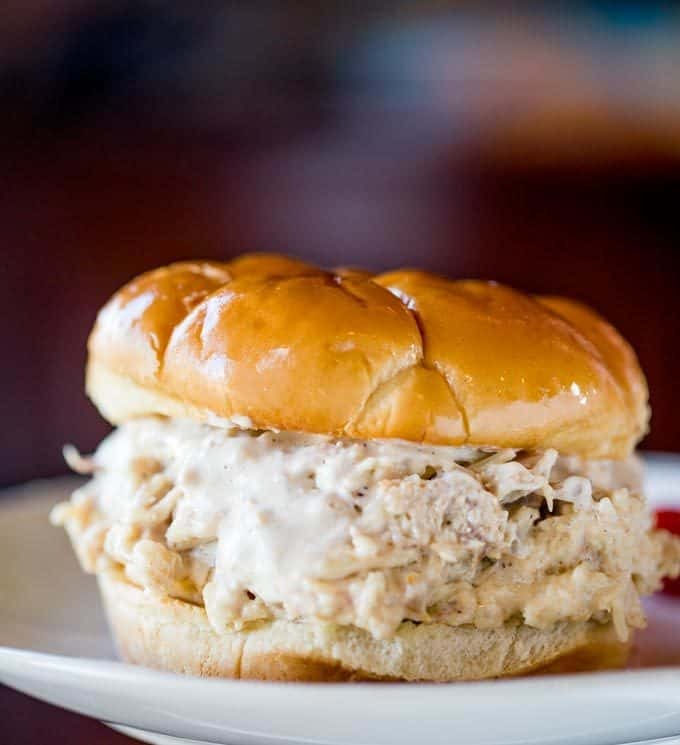 If you’re making this recipe it would be even better for the flavor if you made it when you put the chicken in the slow cooker and then let it sit in the fridge until the chicken was done cooking. Caesar Dressing: I’m a huge fan of this dressing, but it is refrigerated. So If you are looking for a shelf stable option I would recommend Ken’s but I always add a bit more Parmesan and a bit more black pepper when I use that one. Place in the slow cooker skin side up. Remove from the slow cooker and take the skin and bones off the chicken. In a bowl add the chicken, the dressing and the cheese and mix. 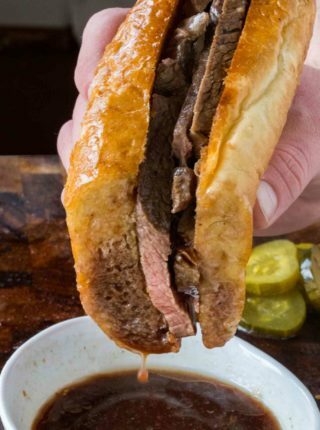 Serve on toasted rolls or hoagie bread. Simply mix together the ingredients and let sit for about 15 minutes. 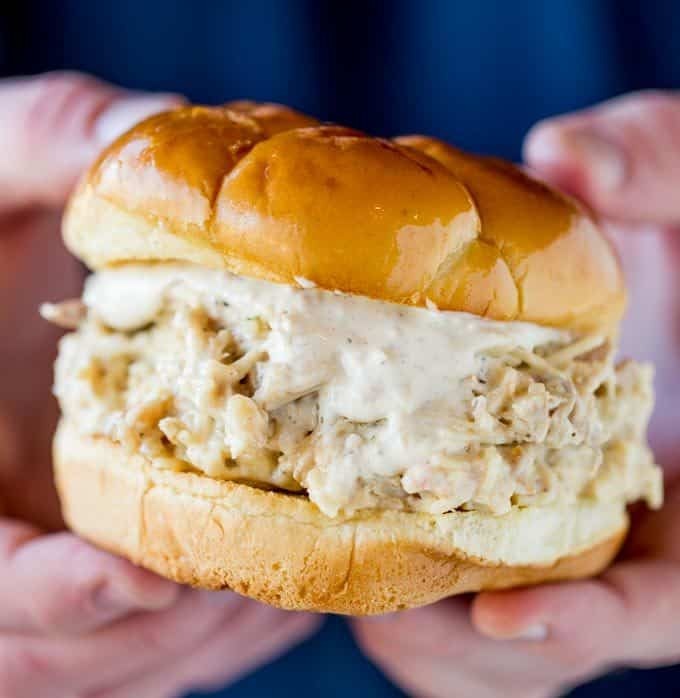 If you're making this recipe it would be even better for the flavor if you made it when you put the chicken in the slow cooker and then let it sit in the fridge until the chicken was done cooking. 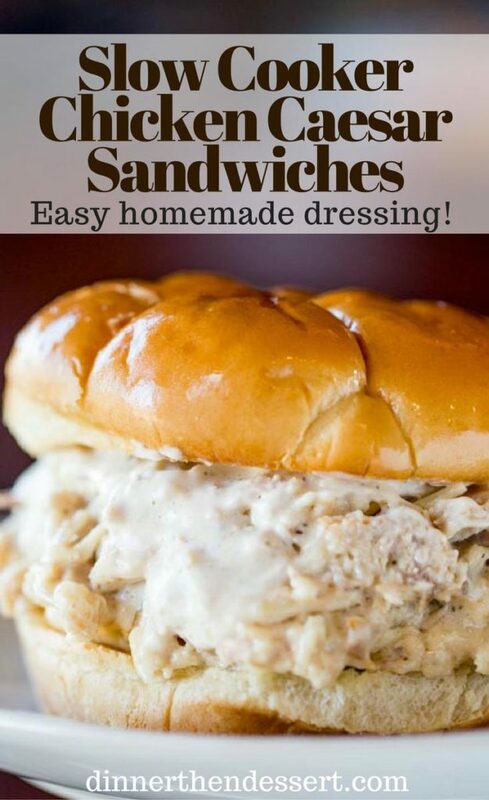 This is the most amazing recipe! We have it every month! I use Ken’s Steakhouse Creamy Caesar instead of making my own. Absolutely delicious and leftovers are just as yummy! My kids eat it on potato buns and I layer it on top of fresh spinach. Delicious! Thanks, Stefanie! I really appreciate you taking the time to come back and let me know how much you enjoyed it! If made with boneless skinless thighs, what would the cooking time be? Dumb question but do you serve this hot or cold? Thanks! You’re right – worked great both ways. Super easy to make and everyone enjoyed it. 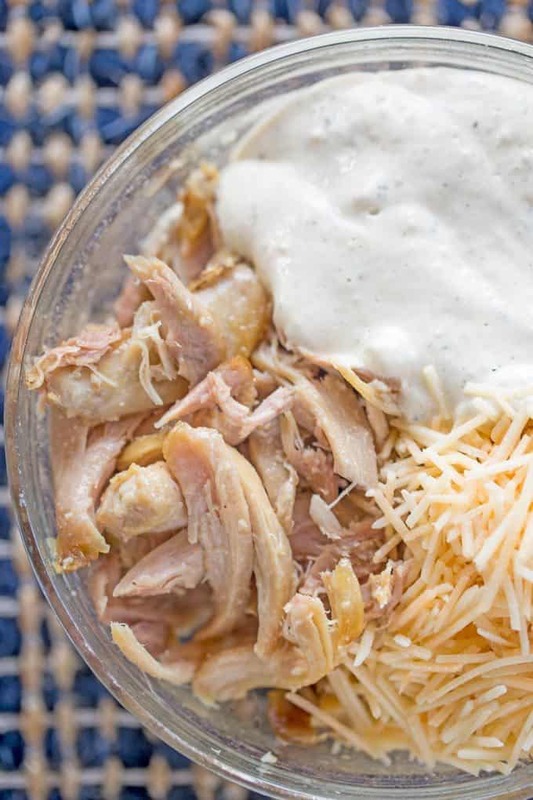 No need to add any liquid in the slow cooker while the chicken cooks. The fat from the skin will render down and allow the chicken to stay moist. Enjoy! Has anyone every tried this over salad for a low carb option? Do you think it will taste ok that way? You could definitely put this over a salad or even use lettuce as the “bun” for a low carb option. Enjoy! Can I just use boneless chicken breasts instead ? I don’t care for chicken thighs. How many would I use ? I hesitate to say yes because they tend to dry out very quickly in the slow cooker. My suggestion would be to at least use skin on as that will help keep it moist. How easy to do this in the crock pot! Gotta add it to my list! QUESTION: Looks delicious. But can I use boneless skinless thighs and then I can skip the “take the bone and skin” off the chicken step? And perhaps use my electric fry pan instead of slow cooker??? Yes, you can use that method too but I just love the ease of using a slow cooker. Yeah, deli meat can be scary! I’m happy you found this much more delicious solution. Great idea! I’ve been trying to use my slower cooker more often lately and this sounds like a great one to try! Let it do the work and give us a break, right?! Enjoy! 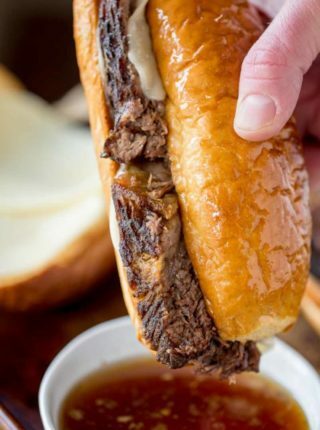 Your slow cooker sandwiches are always killer! 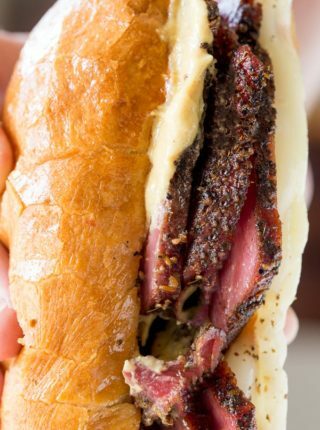 And I’d much rather one of these than a regular deli sandwich. And I know that my husband, who’s a giant Caesar fan, will flip over these sandwiches! Thanks! Hope he enjoys it as much as we did! I could eat these every day! So yummy! I hear you… lunch meat can get old reallllly fast. These look fantastic!! This looks like lunch this week ! Yum!